Teju Cole has a novelistic style unlike many other fiction writers out there today. I guess whether or not you enjoy his work comes down to how you respond to that style. Because here’s the thing: nothing happens in terms of plot. 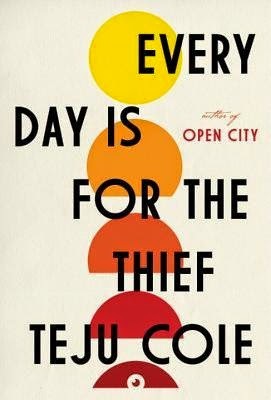 That is true of both of Cole’s novels so far: Open City and Every Day is For the Thief. In Open City, I couldn’t abide the meandering style and the sense that none of what was happening was going to lead to anything. EDIFTT works better, but ultimately falls victim to the same trap. There’s an actual pretense to this book that was lacking in Open City. This one has a narrator returning to his native Nigeria following a long, self-imposed absence, which automatically provides the reader with a framework for everything to follow (Open City was simply about a Nigerian ex-pat taking long walks and pondering numerous things that don’t tie together). The thing is, Cole steadfastly refuses to develop this premise any further. We get some details about the narrator as the pages progress, but he never becomes more than a cypher. The story, such as it is, instead takes the form of little vignettes as the narrator travels his former homeland and observes. The problem is that each vignette is essentially illustrating the same exact point: that Nigeria is riddled with corruption. The basic progression is this: Nigeria is corrupt; let me illustrate that for you. Nigerians don’t make enough money to survive without enforcing corruption; let me illustrate that for you. Children are also bred for corruption at a young age; let me illustrate that for you. Have I mentioned that corruption has infiltrated all levels of Nigerian society? Let me illustrate that for you (again). A small percentage of Nigerians try to live honestly, but their efforts get drowned out by the system. Let me illustrate that for you. And then let me illustrate that again. For a book that’s only 164 pages, it actually starts to feel repetitive alarmingly quickly. Cole is a gifted writer, but his style of storytelling just doesn’t do it for me.